April 1, 1987 -- More than five million travelers journeyed to the Hawaiian Islands last year. Mindful of the fact that Hawaii is the most isolated inhabited land mass on the planet, the overwhelming majority of those five million were smart enough to fly there. But to hear many of the locals tell it, very few of those more than five million visitors were frequent flyers. "We don't get frequent flyers here," insists the general manager of one of Honolulu's best hotels. "What we get--what every hotel or resort in Hawaii gets--is tourists. Upscale tourists, downscale tourists, American tourists, Japanese tourists. Every variety of tourists you can imagine, but no frequent flyers." "It pains me to admit this, but we're not a booming mecca for business travelers," adds an aide to recently retired Governor George Ariyoshi. "Our indigenous business community is small and rather self-contained. We don't have a convention center to lure the big trade events and we're just too far away from anywhere to get the smaller corporate meetings business." The locals are wrong. Incontestably, indefensibly wrong. Frequent flyers go to Hawaii in very large numbers. And the airlines can prove it. On an industrywide basis, airline executives say, at least one of every three free tickets issued as a reward in the frequent flyer bonus programs is eventually used for travel to Hawaii. "It's unquestionably the most popular reward destination that any program offers. No place else comes close," says Michael Boynton, the manager of Delta's Frequent Flyer Program. "Every survey I've ever seen shows that about 70 percent of all frequent flyers consider Hawaii their first choice for an award," adds Steven A. Grosvald, who helped launch United's Mileage Plus and now administers Continental's TravelBank. 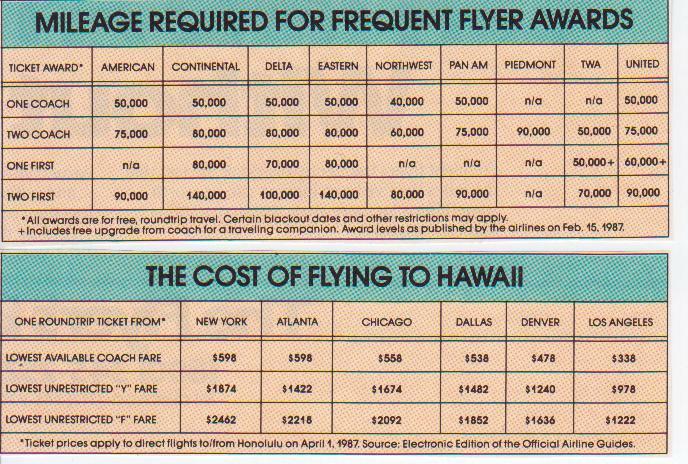 So many business travelers now claim free tickets to Hawaii that the airlines have responded by hiking the number of miles needed to win trips there (see chart). During one 45-day period late last year, for example, five major airlines raised their Hawaii award levels by as much as 25,000 miles. Continental boosted the cots of its award for two coach tickets to 80,000 miles from 70,000 miles; its award for two first-class tickets now requires 140,000 miles compared to the previous 125,000 miles. On American, two coach tickets to Hawaii now require 75,000 miles. Last year, however, two coach seats could be had for only 50,000 miles. Even though United operates almost half of all the seats available between the mainland and Hawaii, the airline said it raised mileage requirements for its own protection. "We were carrying so many free and upgraded trips to Hawaii we had no tickets to sell to paying customers," claims Suzanne Weiss, manager of Mileage Plus. How can frequent flyers flock to the Islands and still escape the notice of Hawaii's travel industry? Probably because they come to Hawaii disguised as any average American tourist. When frequent flyers travel to Hawaii, they are usually flying as leisure travelers rather than business travelers. Unlike the determined expressions and conservative attire they wear when they crisscross the globe on business, frequent flyers who journey to the Islands look and dress pretty much like any other eager vacationer: a bit pasty-faced from lack of sunshine, a touch bleary-eyed from the long flight and clad in the same gaudy outfits all the other tourists wear. But for all their outward resemblance to Mr. and Mrs. Everytourist, frequent flyers who make their way to the land of pineapples and aloha are a totally different breed of leisure traveler. For one thing, they instinctively exchange their bonus award certificates for first-class tickets. On a trip that usually requires at least one connecting flight and as much as twelve hours of flying time, first class is the only choice for anyone hoping to travel with any degree of sanity, civility and tranquility. First class also spares frequent flyers the agony--it is agony--of ten-across coach cabins filled with nervous novices on their one-and-only dream vacation, large and raucous tour groups and young families with bored and fidgety children. "I can't imagine flying to Hawaii in coach and considering it either leisure travel or a frequent flyer rewards," says George Wilkens, a Boston lawyer who has visited Hawaii four times on bonus awards. "Even in first class, the trip is tiring. As much as I have come to love Hawaii, I'd stop going if I couldn't win first-class seats." Another difference is money. Frequent flyers usually have much more of it. That's because frequent flyers have gained a substantial financial benefit from their bonus award. While the average tourist has shelled out hundreds and often thousands of dollars to fly to the Islands, the frequent flyer has traveled free. Spared the onerous cost of financing their airline transportation, frequent flyers have gained the enviable reputation of spending more freely and more often than any other tourist in Hawaii. "Frequent flyers who come over on a [bonus award] have beaten the highest cost of a Hawaiian trip," explains Robert Cotter, senior vice president of Sheraton Hotels in Hawaii. "Naturally, they have much more money to burn and can afford to indulge their more sophisticated and exotic tastes. It certainly is an advantage to fly first class to Hawaii and step off the plane knowing you haven't spent a cent yet." Frequent flyers also have the luxury of conducting their leisure travel at a truly leisurely pace. Convinced that Hawaii is too far away and too expensive to be anything but a once-in-a-lifetime vacation opportunity, many people run themselves ragged trying to squeeze every tourist attraction, every beach, every volcano and the obligatory luau into one eight-day/seven-night package tour. Frequent flyers know better. They linger over coffee at a beach-front café in Waikiki or stop the car on the side of the road and savor the beauty of Maui's upcountry, knowing there's always next time: the next bonus award--and the next free trip to Hawaii--is only a few thousand miles away. "There's no sense of panic to do it all when I'm here," says Cynthia Elmsdorf, a marketing executive and frequent flyer from Dallas. "I've been here four times [on bonus awards] in five years and I've yet to see Pearl Harbor or Volcanoes National Park. But I figure I'll get there eventually. I've already got enough mileage to take a trip to Hawaii next year." But Hawaii also poses some unique and occasionally irksome obstacles for frequent travelers. For one thing, they may feel like know-nothing, first-time tourists in the most unlikely places: Hawaii's airports, hotels and car rental offices. On the mainland, frequent flyers are buoyed by the knowledge that those facilities are prepared to handle their special needs and temperament. Not so in Hawaii, where airports, hotels and car rental agencies skew their services to the needs and requirements of vacationers and tour groups. Hawaii's airports are especially annoying to frequent flyers. The major jetport, Honolulu International on the island of Oahu, is the nations' tenth busiest. It is modern, clean and spacious, but not well-suited to the standards of frequent flyers. Check-in counters are clogged with bemused tourists who need the better part of the afternoon to check their luggage and choose a seat. Signage is woefully inadequate. Departure fingers are unbelievably long: it often takes fifteen minutes to reach the most distant gates. And then there's that inexplicable 50-cent charge for the "Wiki-Wiki," HNL's inter-terminal shuttle bus. The airports on Mau, Kauai and the Big Island are all ancient, overcrowded and vaguely reminiscent of airfields in the poorer banana republics. Plans for the much-needed renovation and expansion of these fast-growing airports have been trapped in the quicksand of Hawaii's environmental protection system. Hawaii's car rental procedures are likely to flummox even the most unflappable. Although all the familiar national names are represented--as well as a slew of aggressive local competitors--very little else about renting a car will seem familiar. In Hawaii, corporate rates don't apply, the popular sign-and-drive "express service" programs don't exist, and even the rental contracts and optional insurance packages are different. Renting a car at the airports on Maui, Kauai and the Big Island is an irritating but necessary inconvenience. Renting at Honolulu Airport, however, is tantamount to hell. Between the long lines and the tedious paperwork, a car rental at HNL can easily require more than an hour. Honolulu's savviest travelers bypass HNL's car rental booths and take a cab to their hotel (about $20). Then they pick up a prereserved car from the rental companies' storefront offices on Kalakaua Avenue (Waikiki's main drag) or their rental booths in the major hotels. Hawaii's hotels and resorts are among the best in the world and many of the best-known business hotel chains are represented on one or more of the Islands. But again, their emphasis is on service to the tourist, not the frequent traveler. Hawaiian hotels are terrific at providing all the beach towels and other amenities a vacationer needs. They're a bit less wonderful when it comes to providing some of the simpler amenities frequent flyers have come to expect from a hotel. Even some of the best hotels in Hawaii don't offer 24-hour room service or same-day laundry and dry cleaning.